Gather ‘round every sunset — instead of the big-screen TV — with the main attraction being the view. Our Manitou SES offers the most flexible floorplans available, so you can customize your entertaining area just the way you want it. Surround yourself with family and friends, with just the right spots for all your food and beverages. With a 300hp Evinrude E-Tec outboard, the adrenaline factor will be present for your guests as well! Length Overall*/Deck: 26' 4"/25' 10"
SES FLIP: Dubbed the Cleopatra Lounger, the SES Flip floorplan offers a huge rear lounge seat that, when not occupied by sunbathing royalty, converts to spacious picnic seating. SES BAR: The SES Bar Floorplan offers adjustable height barstools as well as thoughtful amenities such as cup holders and LED lighting. The SES Bar is identical to the Entertainer, but swaps out the galley for an ultra comfortable bench. SES GALLEY: Food, drink, and fun are the focus with the SES Galley, as it features a built-in grill, sink and refrigerator. The Galley is much like the Entertainer, but the bar seating is replaced with crowd pleasing bench seating. SES ENTERTAINER: Push off from the dock and never look back. Absolutely everything you’ll need to entertain the masses is right on-board. The full galley includes a sink, fridge and a grill. Invite your guests to watch all the action or enjoy a meal perched atop the four height-adjustable bar stools. 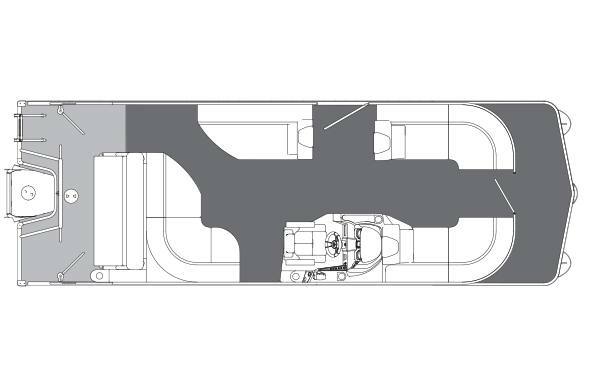 SES BENCH: The SES Bench floorplan provides bench seating from bow to stern. Combined with the rear-facing bench that folds down to create a large sunpad, the SES Bench Floorplan offers plenty of seating options for any kind of activity.